I recently visited PEI's Fall Flavours Festival. 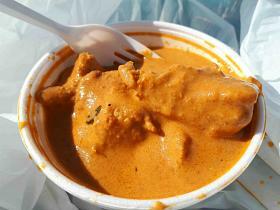 That's when I discovered in Charlottetown the best Indian butter chicken that I have had in my travels across Canada. The butter chicken prepared by 4S Catering is simply amazing. I would rate their butter chicken to be a 6 out of 5 stars in my very demanding system of reviews. 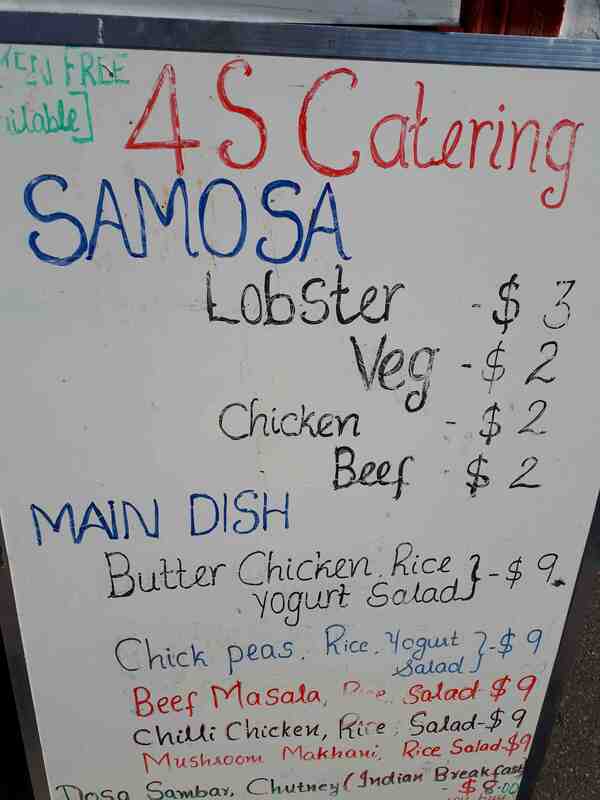 4S Catering prepares the kind of butter chicken which all restaurants should strive to make. It has what I would describe as the perfect balance of spices obviously prepared with quality ingredients. The only other time I have ever rated a restaurant or other food establishment to have an A ++ 6 out of 5 restaurant was corn bread at Chef David Adjay's resto on Queen Street. I'm a "foodie" who seeks out restaurants across Canada and the U.S. to explore. I also cook and have a mixed South Asian background, so I know my butter chicken. Too often I find butter chicken at Indian restaurants which are either too sweet, too rich, too low quality of some other constructive criticism. That's sometimes because in the pressure for commercial profits to pay rent, some Indian restaurants are not necessarily making the best butter chicken the could. 4S Catering obviously focuses on quality first and that's what anyone should expect at such a commercial food establishment. 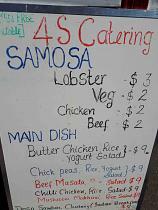 I happened to be visting the Charlottetown Farmers Market on a Saturday when I stumbled on 4S Catering. When I first saw their booth at the Market I immediately began to be curious about how their Indian food might be. I began to speculate maybe not so good. After all, Charlottetown is not particularly know for Indian food, and the Indian community on the Island is relatively small. PEI has been trying to advance its reputation as the "Food Island" among tourists. PEI's Fall Festival of Flavours is at the centrepiece of the promotions regarding PEI as the Food Island. But in my trip to PEI this time, it was not the Beef and Blues event which caputured my foodie attention that was under the guidance of venerated Chief Micheal Smith. Surprisingly, in my trip to Ottawa, it was a great Indian "street food" establishment at the Market in Charlottwtown which caputured my adulation. Charlottetown Farmers Market is fabulous. It is extremely well attended with lots of local produce, pasteries and crafts from various vendors. I recommend anyone vistiting Charlottetown to try to make sure to visit this Market. I always look forward to visiting Charlottetown and make this one my number one places to check out. You might think that the best Indian butter chicken in Canada might be found either in Vancouver, Toronto, Montréal or even Ottawa. 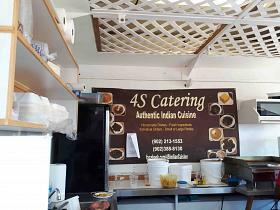 4S Indian cuisine has been very success providing catering service in Charlottetown since 2010. 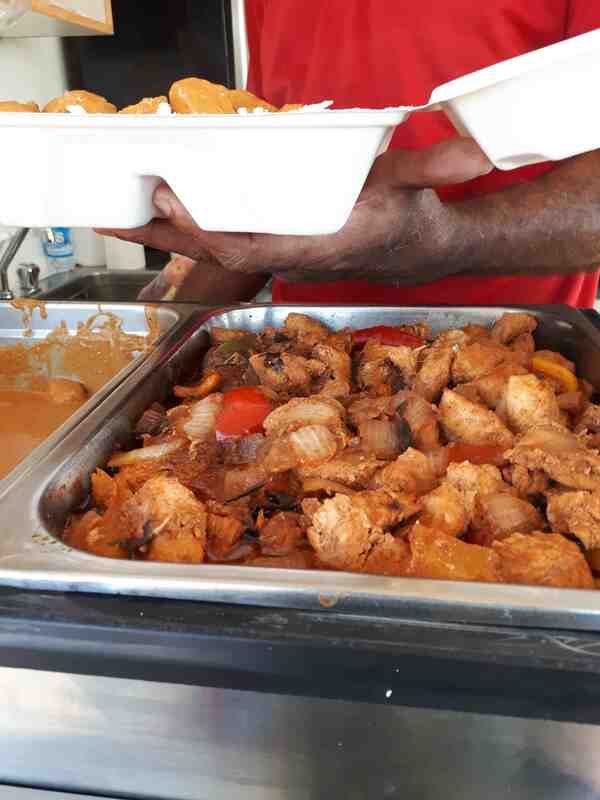 The owners / chefs of 4S Catering stipulate, "The company is offering order taking for small to midsize events such as birthday party, wedding, anniversary celebration, small orders etc." 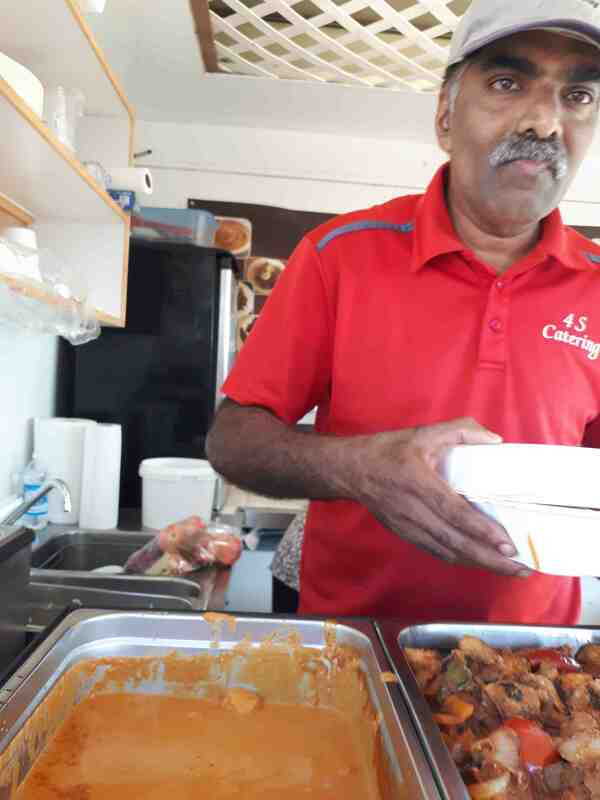 The main Chef / Owner Sunil Daniel has many of years of experience providing east / south Indian menu and western style catering in province of Alberta, Canada since 2005. 4S owner is proud to not only offer traditional style Indian cuisine, but they also add south Indian flair." "Respectively, we strive to be the BEST Indian restaurant in Charlottetown, PEI," say the owners. There's one British-style pub in Charlottetown which claims to have the best butter chicken in the city. But I would not agree. My money on best butter chicken in Charlottetown, if know the whole of Canada, is none other than 4S. If you're in Charlottetown today, which is a Saturday, my advise to you if you want to try them out is to turn off your computer now, and drive or run there. But drive safely though. If you read this article too late, you'll have to wait for them on a following Saturday or call them to explore their catering options. Try them at the Market and you're sure to be amazed whether you're from across Canada, the U.S., abroad or are from India. 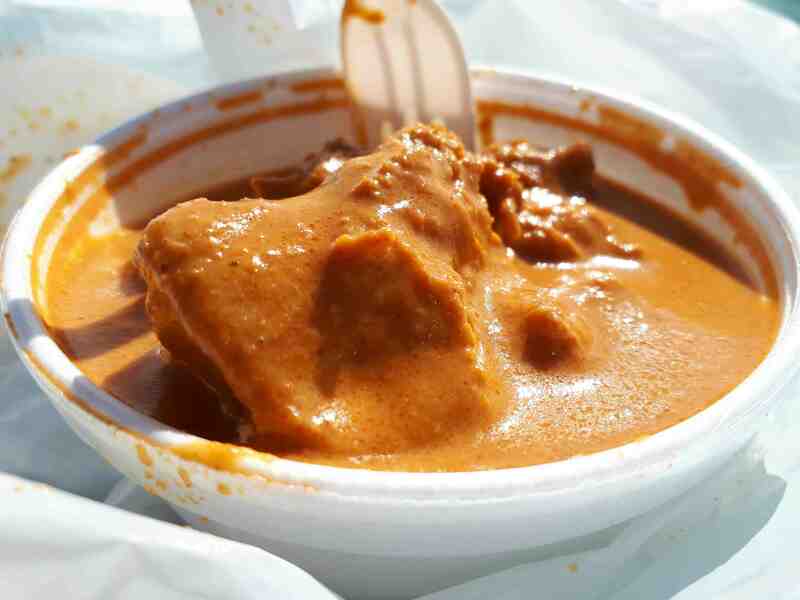 India has many diverse styles of butter chicken, But the quality offered by 4S is almost beyond words.